Just Cause 3 has been out for about a month and a half now and people have had some time to get used to the game and all the fun things that you can do in it. 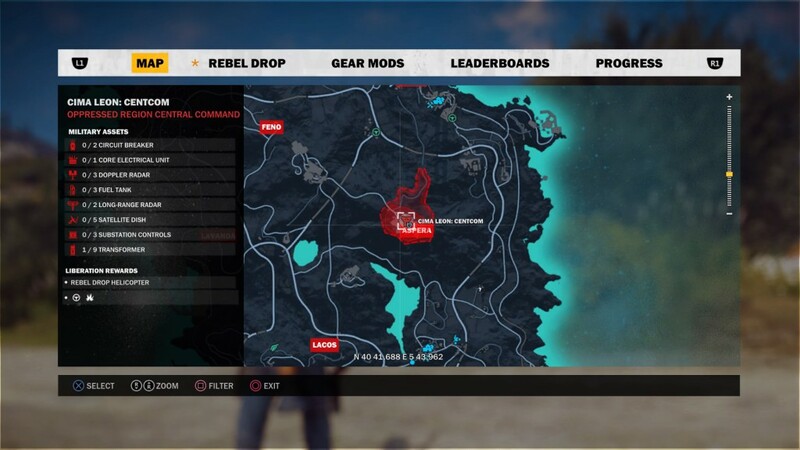 I’m certainly enjoying it myself because of the use of the wingsuit and the many upgrades you can get which include upgrades to weapons and explosives as well as vehicles including aircraft and exploring the Just Cause 3 provinces. The map is quite big, over 400 square miles as a matter of fact and that is broken up into islands and different terrain. I greatly underestimated the map myself as I thought that the island you start on was the main island or map of the game. As I zoomed out on the map, I quickly found out that that was not the case at all. Main island of the game. As you will see from the main map in the game, from whichever island you are on you’ll see it divided up into provinces. Now they are all outlined in red once you first start the game. What that means is they are all under the control of the nasty dictator named General Sebastiano Di Ravello. As the game’s main hero, which is Rico, you’re goal is to liberate the different towns and provinces so that they are no longer under his control. This will help you get access to the weapons and vehicles you need without the threat of being under attack by Di Ravello’s forces (usually). One thing you will notice on the island that you first start out on is that in nearly the center of it there is a military or regional command center. Once you fully liberate the towns and cities on the island in the different provinces, you will want to take out that regional command center because the other provinces will still be outlined in red until that is taken down even though you may have liberated all of the towns there. I must warn you though, DO NOT attempt to take it down without completing certain main missions of the game otherwise you will be in a big world of hurt. One thing that you will notice as you get close to the command center is that you’ll see a big bright red area surrounding you meaning fighter jets have you targeted and are about to bomb you into the stone age! That’s not to mention tanks, heavy machine guns and the other forces that will come to blast you away. I found this out the hard way and believe me I have learned my lesson. I haven’t taken out the first regional command center yet, but I learned you have to complete one of the main missions in the game that will disable the long range radar so that you won’t constantly get attacked by the jets thus making it much easier to take down the command center. In order to take it down (or over), you have to destroy certain things inside of it such as generators, communications towers, fuel tanks, etc…It is very similar to what you have to do to liberate the towns, but in the towns you take over the police stations, destroy statues, take out massive speakers spewing out propaganda and, destroying billboards and more. Once you do all of that, then you raise the flag which is usually in the center of the town and the town is liberated. The province itself won’t be fully liberated yet, but at least you’ve started the process. The great thing about liberating the towns in these provinces is that you’ll have access to the town’s garage and also nearby challenges which you’ll want to do so that you can unlock gear mods to upgrade the different things that you use or will use on a regular basis. Some of the gear mods include nitro boosts for cars, explosive mods such as booster explosives which you can put on objects (or people as it is hilarious!) and watch the object zip around very fast usually high into the air and then suddenly explode. As I just mentioned, you can attach them to people and it is so funny to see people launch into the air. Good to use on enemies. One other thing I forgot to mention is that once you fully liberate a province, you are free to use the fast travel feature which is very handy given the size of the game map. I also like the fact that you can have different gear mods to the grappling hook that you use in the game. One of the gear mods I unlocked for it, makes the grappling hook move much faster when in use as you sling towards something. Trust me, this comes in very handy when you are in heavy combat with the general’s forces and you need to get away quickly because you’re taking a lot of hits and could die quickly. It has helped me out a lot in hectic situations especially the first time I tried taking out the regional command center. Location of first regional command center. Overall though, it is fun exploring the provinces especially once you liberate them and its towns thus generally ensuring your safety as you explore and do the many different challenges. Now as I mentioned in my full review of the game, I still am planning on doing a video series of Just Cause 3 and you’ll definitely see me in action as I do go about liberating the towns and provinces. It should definitely be interesting, but I’ve been fine tuning some things first before I get it going. In the meantime, here is a video clip showing how I liberate a town and the different things I have to take out in order to do it. I still like how the explosions look in the game, but there is still the frame rate drops when there is a lot of action going on. It is still definitely an annoyance, but it doesn’t take away full from my enjoyment of the game. I think the game developers are still working on ironing this out so I should expect another patch to the game soon. Have any of you played the game yet? Have you successfully liberated any provinces? What’s the most challenging thing going on for you in the game at the moment? 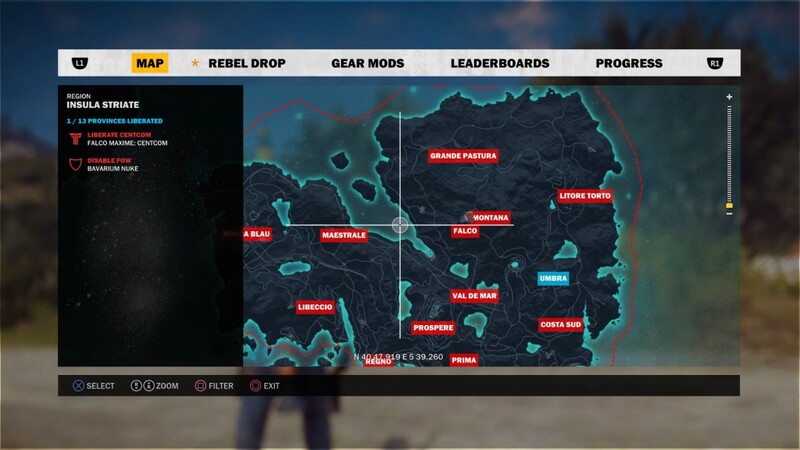 Overall, what do you think of Just Cause 3’s provinces and the large map that you get to explore? Don’t hesitate to leave some comments as I would love to hear your answers to some of these questions! Enjoy the video below! Hey there, glad you like my site and article regarding Just Cause 3! Definitely check back as I will be posting more stuff about Just Cause 3. I’m so excited to play Just Cause 3, I’m gonna buy it secondhand when I find it for a reasonable price. It looks awesome. The graphics really are something else – they’ve done such a great job on it! The storyline sounds great and the map looks pretty big too. I do like a game where there’s lots of exploring to do! I think you’ll definitely get a great deal of enjoyment out of it! The map is really an impressive size and I like the fact that when you liberate the provinces you can use the fast travel feature in the game. Awesome review of the just cause 3 provinces video game. I have been on the fence about this one for a couple of weeks now, but after reading your article I think I will go ahead and take the plunge. The game play in that cool video looks great! I think you’ll have a lot of fun with it when you buy it. Lots of different challenges to do and exploration of the massive map as well. I really do like liberating the towns and provinces now and doing some funny things with the grappling hook and its upgrades. I must admit I had never heard of this game until I began reading your review. But after reading it I must say it has sparked my interest. It sounds similar to Far Cry 4 in the aspect that you have to free certain areas to take down the baddy. I think one that makes me want to try the game more is the fact that it’s obvious that this review is based on personal experience playing the game and not just research of information from other sources. It makes it more authentic to me and I’m more willing to try it. Thanks again for the good review. Hi there Daniel! Glad you like my review. Open world games such as Just Cause 3 are my type of games so if I review them, I definitely want to share my experience with the game and whether I enjoyed it or not. It has been awhile since I’ve played, but I would like to get back into it as they do have some great downloadable content for it.